Students are ready for it and teachers are looking forward to it. 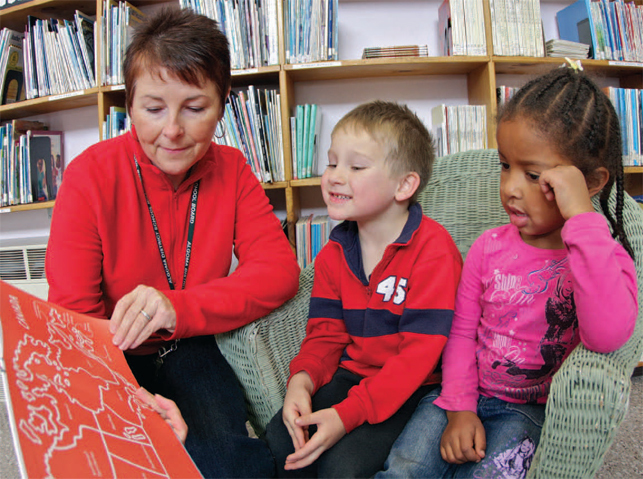 Full-day everyday kindergarten boost in learning, ETFO members who teach kindergarten say. And it will allow teachers to give their students the full benefit of their knowledge and skills. In October the Ontario government announced that full-day, everyday kindergarten programs would roll out across the province starting next fall. The government has allocated $200 million to the program in 2010-11 and $300 million the following year. An estimated 35,000 spaces will be created for four and five-year-olds in the first year. There are already more than 180 public elementary schools that have full-day, everyday kindergarten programs in various school districts around the province. One such board is Algoma. ETFO member Jane Vienneau teaches in Echo Bay, a community about 30 kilometres east of Sault Ste. Marie. She has taught full-day SK classes for the past six years. “It began as a pilot project,” Vienneau says, “and the board saw such great success they decided to continue it and offer it even though they were not funded for it.” The program is available at all schools that have enough students. Vienneau’s program has always been play-based, an approach she learned as a student at Nippissing University. In this kind of program children learn academic concepts by spending time at activity centres such as water tables, drama and art centres, and sand tables. Vienneau sets up these centres to align with the curriculum concepts she is focusing on. It’s an approach supported by research into how children learn. Those who think this is not real learning are misguided, Vienneau says; her students leave kindergarten ready for the challenges of grade 1. “Most are reading by the time they leave kindergarten,” she notes. Lord Dufferin school is in a high-needs area. There are many low-income families living in the nearby Regent Park social housing community and a significant number of ESL students. Being in class all day, every day gave the children more time to adjust to school. “Some kids have never been in day care or preschool, they come straight from the home. They have little social experience,” Lum says. “In the beginning some had difficulties.” But teachers adjusted the program to meet children’s needs and “they quickly adjusted” to school routines and expectations. Students who don’t come from enriched home environments make huge gains in full-day, everyday programs, says Suzanne Mercier, a member of the Niagara Teacher Local. A full-day, everyday program allows teachers “to close that gap” between students from less advantaged situations and those who are more privileged. “By the end of the year, they are struggling a lot less,” Mercier says. Students who might not be able to identify the letters in their name at the start of the year leave her kindergarten reading at or above their appropriate level. Class size and class composition will be important factors in the success of full-day programs, kindergarten teachers say. Provincial government funding will be based an average class size of 26, with one full-time teacher and a full- time early childhood educator (ECE). Mixing JK and SK students in the same class adds to the challenges. Those who teach split-grade kindergarten classrooms say the difference between the two groups of children is even more challenging than split grades with older age groups. JKs have quite different needs, says Angèle Guénette, a North Bay teacher who teaches a class made up of 13 full-day everyday SK students and six half-time JK students. “The SKs know the routines, they’re ready to learn.” Mercier agrees. When she had an all-day everyday SK class, it “made a huge difference” in children’s learning. All of the teachers look forward to working with ECE-trained staff. Some have already had that opportunity. Six years ago Jane Vienneau had an assistant who was studying ECE. “She had worked in child care for many years and came with a wealth of knowledge.” She hopes that the addition of an early childhood educator will also provide more flexibility in the kindergarten classroom and in how teachers work with students. When she was teaching a full-day everyday kindergarten, Cindy Lum also had an assistant who was taking ECE training. “We worked together as a team; it worked very well,” Lum recalls. Suzanne Mercier took ECE training before going to university to get her teaching credentials, and later a master’s degree. The knowledge that ECE staff bring will be beneficial for children, she says. But there is no doubt in her mind that an ECE working alone would not be able to fill a teacher’s role. Many issues will need to be resolved as the new program unfolds. The teachers interviewed for this article all have a number of additional qualification courses in their repertoire. ETFO has taken the lead in providing members who want to work with young children opportunities to enhance their professional knowledge. The website “A Thousand Moments of Learning” (http://1000moments.net) was created specifically for kindergarten teachers. ETFO is also offering the Kindergarten AQ course. For more information visit etfo-aq.ca or go to etfo.ca >Professional Development >AQ Courses. The statistics are in, finally proving what everyone with an arts education has long known: boys in Canadian schools are well behind girls in academic performance, particularity in reading and writing. Last spring the ETFO executive turned the first page in an exciting new chapter in the history of our federation: it decided that our federation would unionize early childhood educators (ECEs) employed by public and Catholic district school boards.